This article is about the athletics programs of The University of Texas at Austin. For the cattle breed, see Texas Longhorn. For other uses of Longhorn, see Longhorn (disambiguation). The Texas Longhorns are the athletic teams that represent The University of Texas at Austin. The teams are sometimes referred to as the 'Horns and take their name from Longhorn cattle that were an important part of the development of Texas, and are now the official "large animal" of the U.S. state of Texas. The women's teams are sometimes called the Lady Longhorns, but generally both the men's and women's teams are referred to as the Longhorns, and the mascot is a Texas Longhorn steer named Bevo. The Longhorn nickname appeared in Texas newspapers by 1900. The University of Texas at Austin is the flagship institution of the University of Texas System. It offers a wide variety of varsity and intramural sports programs, and was selected as "America's Best Sports College" in a 2002 analysis by Sports Illustrated. Texas was also listed as the number one Collegiate Licensing Company client from 2005–2013 in regards to the amount of annual trademark royalties received from the sales of its fan merchandise. Texas is the only remaining NCAA Division I school to operate separate men's and women's athletic departments, after the other remaining holdout, the University of Tennessee, merged its men's and women's athletic departments at the end of the 2011–12 academic year. A charter member of the Southwest Conference until its dissolution in 1996, the Texas Longhorns now compete in the Big 12 Conference, as a member of the National Collegiate Athletic Association. The school's colors are officially Orange (Pantone 159) and White, with Burnt Orange — also known as Texas Orange – being the specific shade of orange used. The University of Texas Longhorn Band performs the alma mater ("The Eyes of Texas") as well as the university fight song ("Texas Fight") at various sporting events. Over the years, Longhorn sports teams have won 52 total national championships, 44 of which are NCAA National Championships. The University of Texas currently fields a varsity team in nine men's sports and eleven women's sports. Two Texas Longhorn running backs have won college football's most prestigious individual award, the Heisman Trophy: Earl Campbell (1977) and Ricky Williams (1998). Seventeen Longhorn players and two Longhorn coaches have been inducted into the College Football Hall of Fame, while four are enshrined in the Pro Football Hall of Fame. Other Longhorn players have also received recognition for their performance. In terms of total wins, Texas is the 2nd-ranked NCAA Division I FBS program in college football history with 891 wins, after passing Nebraska during the 2016 season. As of the end of the 2016 season, the Longhorns' all-time record is 891–359–33 (.709). Only the University of Michigan has won more games and a greater percentage of games played than Texas, which recorded its 800th victory with the Longhorns' 41–38 win over the USC Trojans in the 2006 BCS National Championship Game at the Rose Bowl. During the late 1980s and early 1990s, the program was somewhat less successful, but the Longhorns have since returned to prominence in college football, finishing in the top six of the AP and coaches' polls in 2001, 2002, 2004, 2005, 2008 and 2009. The University of Texas team plays home games in Darrell K Royal-Texas Memorial Stadium which has a seating capacity of 100,119. Renovations began on the stadium November 14, 2005, two days following the last home football game of the 2005 season. The improvements were completed before the 2008 football season, and included additional seating and the nation's first high definition video display in a collegiate facility nicknamed "Godzillatron." The University completed a $27 million expansion and renovation to the south end zone facilities in August 2009 which added 4,525 permanent bleacher seats and changed the playing surface to FieldTurf. With the new permanent bleacher seating section added behind the south end zone and the total remodeling of the north end zone completed in 2008, the stadium's official capacity now stands at 100,119. This was surpassed when 101,357 saw #3-ranked Texas beat Kansas 51–20 on November 21, 2009. The Longhorns are currently coached by Tom Herman, who came to Texas in November 2016 after being head coach at Houston. Mack Brown became the head football coach for Texas in 1998. From 1998 through the 2008–2009 season, the Longhorns had a 124–27 win-loss record. In his first six years at Texas, Brown had a winning record but he had not won the Big 12 conference or to lead the Longhorns into a Bowl Championship Series game. He was often lauded for his recruiting while being criticized for failing to win championships. That changed with the 2004 Texas Longhorns football team who played in the 2005 Rose Bowl against the Wolverines of the University of Michigan. The game was the first meeting between the two storied teams and the Longhorns' first trip to the Rose Bowl. In a classic game that featured five lead changes and three tie scores during the course of play, the Longhorns defeated the Wolverines 38–37 on a successful 38-yard field goal by place kicker Dusty Mangum as time expired. It was the first time the Rose Bowl had ever been decided on the closing play, and it earned the Longhorns a top 5 finish in the polls. Three ex-Longhorns from the 2005 Rose Bowl team — Cedric Benson, Derrick Johnson, and Bo Scaife — were selected in the 2005 NFL Draft. Brown followed up the strong 2004 season on the field with an extremely successful 2005 recruiting season by securing the top-ranked recruiting class (the 2005 recruiting season is for players entering the University in Fall 2006). With the exception of Cedric Benson, Derrick Johnson, and Bo Scaife, Texas returned most of their key players from 2004–2005, including red-shirt Junior Quarterback Vince Young. The 2005 Texas Longhorns football team was given a pre-season No. 2 ranking (behind defending National Champions University of Southern California) by Sports Illustrated magazine, and was also ranked second in the AP and USA Today coaches' pre-season polls. They maintained those rankings throughout the entire 2005–2006 season. Texas and USC ended up winning out their seasons and faced each other in the National Championship, which Texas won, 41–38. At the conclusion of the 2005–2006 season, Sports Illustrated issued a special commemorative edition that featured Vince Young shouting in triumph amidst a storm of multi-colored confetti. Features in the special edition included a story on Vince Young's Glory Days by author Tim Layden, as well as a story dissecting How the Rose Bowl was won by Austin Murphy. The issue was on sale nationwide alongside the regular edition of the magazine, which also featured the Rose Bowl on the cover. The 2006 Texas Longhorns football team hoped to repeat as national champions. The Texas Longhorns returned several offensive (7) and defensive (7) starters from their national title team, but quarterback Vince Young elected to go the NFL which left freshman Colt McCoy as the starting quarterback. The Longhorns opened the season with a win at home against North Texas. Their second game, against Ohio State, was one of the most anticipated college football games of the regular season. The Longhorns lost that game, but then defeated Rice, Iowa State and Sam Houston State by a combined score of 145–24. Then they defeated 14th-ranked Oklahoma 28–10 in the Red River Rivalry. The Longhorns lost their last two regular season games to Kansas State (45–42) and Texas A&M (12–7). A victory against A&M would have clinched the Big 12 South Division title for the Longhorns. As a result of the loss, Oklahoma won the division and played in the Big 12 Championship game. The Alamo Bowl, with the 5th pick of Big 12 conference teams selected the Longhorns to play against unranked Iowa who had placed 8th in the Big Ten conference. With Colt McCoy at quarterback, the Longhorns narrowly defeated the Iowa Hawkeyes 26–24. The 2007 Texas Longhorns football team began play on September 1, 2007. Texas entered the 2007 season ranked third in the all-time list of both total wins and winning percentage. They were ranked in the Top 10 by numerous pre-season polls. For instance, a pre-season ranking by ESPN writer Mark Schlabach had the Longhorns ranked eighth; Rivals.com has them at ninth. College Football News and Real Football 365 both had the Longhorns ranked third. The Longhorns come into the season ranked fourth in both the Coaches' Poll and AP Poll. The Longhorns failed to make good on that ranking, however, dropping to number 20 in the BCS standings after losing to conference foes Kansas State, Oklahoma, and Texas A&M. The 2008 Texas Longhorns football team entered the season with freshmen athletes at many positions, no definite starting running back and appeared to lack talent at key positions. The Longhorns were projected to post a 9–3 during the 2008 season, and were ranked Nos. 11 and 10 in the AP Poll and the USA Today Coaches Poll, respectively. Despite doubt surrounding the season, the Longhorns rallied to an 8–0 start, including a four game in-conference stretch against opponents ranked in the top 12 football teams in the country. During that stretch, the Texas Longhorns defeated BCS ranked No. 1 Oklahoma, No. 11 Missouri, and No. 7 Oklahoma State before losing to No. 7 Texas Tech on November 1, 2008. On January 5, 2009, Texas defeated No. 10 (according to final BCS rankings) Ohio State in the Fiesta Bowl 24–21. The loss to No. 7 Texas Tech was the only loss for the 2008 Texas Longhorns, finishing 12–1 overall, 5–1 in the Big 12 Conference South Division and No. 3 in the BCS rankings, No. 4 in the final AP Poll, and No. 3 in the final USA Today Coaches Poll. The 2009 Texas Longhorns football team entered the season with a veteran quarterback in Colt McCoy and high hopes of winning a national championship. The Longhorns were ranked No. 2 in both the AP Poll and the USA Today Coaches Poll. The Longhorns finished the season 13–1, and 8–0 in Big 12 play. They represented the Big 12 South Division in the Big 12 Championship Game where, on a last second field goal, they defeated Nebraska 13–12 to become Big 12 Champions. The Longhorns finished the regular season ranked No. 2 in the Bowl Championship Series to earn a birth in the BCS Championship Game where they were defeated by Alabama 37–21 after an early injury to Colt McCoy. Texas finished the season ranked No. 2 in the AP and coaches poll. In 2010, after losing six players to the NFL Draft, the Texas Longhorns finished with their worst record under Mack Brown, going 5–7 and finishing last in the Big 12 South, ending a string of nine 10 or more win seasons. The only signature win of the season was a 20–13 upset in Lincoln over Nebraska in their final in-conference match-up. In 2011 the Longhorns finished the season 9–4, 5–4 in Big 12 play, in a tie for third place. They were invited to the Holiday Bowl where they defeated The University of California, Berkeley. Quarterback Garrett Gilbert was named the starter for the Longhorns August 29 in their season opening against Rice University. However, on September 12, it was announced that Gilbert was being moved to the second-string quarterback behind Case McCoy and David Ash who would be sharing the starting position for the duration of the season. On September 20, it was announced that Gilbert underwent successful surgery on his shoulder and will be out the remainder of the season. Knowing that his future in Austin looked bleak, Gilbert sought an unconditional release, which was granted to him on October 5. Gilbert finished his degree at Texas before moving to Southern Methodist University in Dallas to continue his football career. Charlie Strong was hired as Texas' head coach in January 2014. Strong replaced Mack Brown after 16 seasons. Strong finished the season 6–7, 5–4 in Big 12 play to finish in a three-way tie for fourth place. They were invited to the Texas Bowl where they lost to Arkansas. Strong finished the season 5–7, 4–5 in Big 12 play to finish in a three-way tie for fifth place. Strong finished with a second-straight 5–7 season. Charlie Strong was fired as Texas' head coach at a morning meeting on November 26, 2016. Charlie Strong ended his tenure with Texas as the most losing head coach in Texas football history, posting a 16-21 record with a .432 win percentage. The Texas Longhorns football program has produced 120 All-American selections (93 players), with 48 of these being Consensus All-American selections (41 players) and 21 of these being Unanimous All-American selections (18 players). ** Renamed the Davey O'Brien National Quarterback Award in 1981; now honors the nation's best quarterback. Honorary captain – Louis Jordan (1911–1914) – Note: First Texas player to make the Walter Camp All-American team. He was later killed in battle while fighting in France during World War II. The University of Texas began varsity intercollegiate competition in men's basketball in 1906. The Longhorns rank 18th in total victories among all NCAA Division I college basketball programs and 25th in all-time win percentage among programs with at least 60 years in Division I, with an all-time win-loss record of 1791–1088 (.622). Among Big 12 Conference men's basketball programs, Texas is second only to Kansas in both all-time wins and all-time win percentage. The Longhorns have won 27 total conference championships in men's basketball and have made 34 total appearances in the NCAA Tournament (11th-most appearances all time, with a 35–37 overall record), reaching the NCAA Final Four three times (1943, 1947, 2003) and the NCAA Regional Finals (Elite Eight) seven times. As of the end of the 2017–18 season, Texas ranks sixth among all Division I men's basketball programs for total NCAA Tournament games won without having won the national championship (35), trailing Kansas State (37), Notre Dame (38), Purdue (39), Illinois (40), and Oklahoma (41). The Longhorns have also won 2 NIT championships, in 1978 and 2019. Texas' best season is arguably the 1932-33 season when the team went 22-1, won the Southwest Conference and was named unofficial National Champion by the Premo-Porretta Power Poll. Since the introduction of the AP poll, Texas' best season was 2002-2003 when it went 26-7, earned a #1 seed in the NCAA tournament, made it as far as the Final Four and finished the season ranked #3 in the AP poll. The 2005–06 season marked the 100th anniversary of basketball at the University of Texas. Special logos were placed on the uniforms to commemorate this anniversary. In 2007, the men's basketball team was ranked sixth by the Harris Poll for favorite men's college basketball teams, moving up one spot from the previous year. The women's basketball team has long been a national power, especially during the late 1980s (winning a national title in 1986) and through the 1990s. Both teams play home games in the Frank Erwin Special Events Center. The adjacent Denton A. Cooley Pavilion serves as the training and practice facility for both the men's and women's teams. The Texas Longhorns are the winningest team in college baseball history, both in terms of total wins and in terms of win percentage. Texas holds the records for most appearances in the College World Series (35) and most individual CWS games won. The Longhorns have won six NCAA baseball national championships (1949, 1950, 1975, 1983, 2002, and 2005) — second only to Southern California's total of 12 – and have appeared in the CWS Championship Game or Championship Series on six other occasions (1953, 1984, 1985, 1989, 2004, and 2009). Former Longhorns who have gone on to success in Major League Baseball include Roger Clemens, Bibb Falk, Ron Gardenhire, Calvin Schiraldi, Burt Hooton, Keith Moreland, Spike Owen, Greg Swindell, Huston Street, Omar Quintanilla, Taylor Teagarden, Sam LeCure and Drew Stubbs. From 1997 to 2016, the Longhorns were led by head coach Augie Garrido, the winningest coach in NCAA baseball history. The team plays its home games at Disch-Falk Field. The University of Texas Longhorn's softball team is led by head coach Connie Clark and assistant coaches Jennifer McFalls and Tripp MacKay. Texas has made 19 total appearances in the NCAA Tournament in 22 seasons of varsity competition, reaching the Women's College World Series (WCWS) five times (1998, 2003, 2005, 2006, 2013) and finishing as high as 3rd on three occasions (2003, 2005 and 2013). The University of Texas has a strong golf tradition, winning national titles back-to-back in 1971 and 1972 and again in 2012, and finishing runner-up four other times. Individual national champions were Ed White (1935), Ben Crenshaw (1971, 1972, and 1973), Tom Kite (1972), and Justin Leonard (1994). Longhorns who have won the U.S. Amateur include Justin Leonard and David Gossett. Two-time U.S. Junior Amateur champion and three-time major winner Jordan Spieth played for the Longhorns golf team in 2011 and 2012. Besides Majors-winners Kite, Crenshaw, Leonard and Spieth, a number of other former Longhorn players have gone on to win on the PGA Tour, including: Phil Blackmar, Mark Brooks, Jhonattan Vegas, Bob Estes, Wes Ellis, Harrison Frazar, Cody Gribble, Rik Massengale, Wes Short Jr., and Brandel Chamblee. In addition, Longhorns Brandon Stone and Dylan Frittelli have each achieved multiple wins on the European Tour. Legendary golf instructor Harvey Penick was a long-time coach at Texas. The team is currently coached by John Fields and Ryan Murphy. The women's golf team has been to the NCAA Championship 27 times, tied for 7th overall and finished as the runner-up, or tied for runner-up, twice, in 1993 and 2002. Texas women have won three individual championships. In 1978 Deborah Petrizzi won the AIAW national intercollegiate individual golf championship; and Charlotta Sörenstam and Heather Bowie won in 1993 and 1997 respectively. Former players Betsy Rawls and Sherri Steinhauer went on to win 8 and 2 LPGA major championships respectively, with Rawls being inducted into the World Golf Hall of Fame. In March 2019 tennis head coach Michael Center was arrested and charged with conspiracy to commit mail fraud as part of the 2019 college admissions bribery scandal. According to federal prosecutors, a witness told investigators that in 2015 Center agreed to accept approximately $100,000 from the witness as a bribe, in exchange for Center to designate a student -- who did not play competitive tennis -- as a UT tennis team recruit, facilitating his admission to the university. Center was dismissed by the university the day after his arrest. Associate head tennis coach Bruce Berque was named the Longhorns’ interim head coach. On March 20, 2019, the team was ranked # 1 in the nation. The women’s Longhorns tennis team has won nine regular-season titles (two shared), and has won the Big 12 Championship 10 times. In January 2019 the Texas Longhorns women’s tennis team was voted # 1 in the Big 12 Preseason Tennis Poll. The men's program is coached by Edrick Floréal. The Longhorns were runners-up in the outdoor championships in 1987, 1988, and 1997 but have never won a title. Other notable coaches of the Texas men's program have included Bubba Thornton, who also coached the 2008 US Olympic team, Stan Huntsman (1986–95), who also coached the 1988 US Olympic team, and Clyde Littlefield (Texas coach, 1920–60), the 1925 co-founder of the annual Texas Relays. The men won four consecutive Big 12 Indoor Championships between 2006 and 2009. The men have won 41 individual titles, 10th most of all schools. The Longhorn track and field programs have produced numerous Olympians for various nations. Male medalists include Ryan Crouser (United States, shot put, 2016), Leonel Manzano (United States, silver, 1500 meters, 2012), Winthrop Graham (Jamaica, silver, 400m hurdles, 1992 and 4 × 400 m relay, 1988), Patrick Sang (Kenya, silver, 3000m steeplechase, 1992), Du'aine Ladejo (Great Britain, bronze, 4 × 400 m relay, 1992), Lam Jones (USA, gold, 4 × 100 m relay, 1976), Eddie Southern (USA, silver, 400m hurdles, 1956), and Dean Smith (sprinter) (USA, gold, 4 × 100 m relay, 1952). The women's program is coached by Edrick Floréal. Other notable coaches have included Beverly Kearney, who has guided the Lady Longhorns to six NCAA Championships: Indoor Championships in 1998, 1999, and 2006, and Outdoor Championships in 1998, 1999, and 2005; and Terry Crawford, whose teams won Indoor Championships in 1986, 1988, and 1990, and Outdoor Championships in 1982 and 1986. Crawford's athletes also won the 1986 Women's Cross Country Championship. The program's first title was the 1982 AIAW outdoor track and field championship. The Longhorn track and field programs have produced numerous Olympians for various nations. Female Olympic medalists have included Michelle Carter (athlete) (USA, shot put, 2016), Sanya Richards-Ross (2012: USA, gold, 400 meters and 4 x 400 meter relay; 2008, bronze, 400 meters and gold, 4 x 400 meter relay, 2008), Moushami Robinson (USA, gold, 4 × 400 meter relay, 2004), Sandie Richards (Jamaica, silver, 4 × 400 m relay, 2000 and 2004), Merlene Frazer (Jamaica, silver, 4 × 100 m relay, 2000), Nanceen Perry (USA, bronze, 4 × 100 m relay, 2000), Carlette Guidry (USA, gold, 4 × 100 m relay, 1992 and 1996), Juliet Cuthbert (Jamaica, silver, 100m and 200m, 1992 and bronze, 4 × 100 m relay, 1996), and Nikole Mitchell (Jamaica, bronze, 4 �� 100 m relay, 1996). Courtney Okolo became the first Longhorn to win The Bowerman, an award that honors collegiate track & field's most outstanding athlete of the year. In 2016, she became the first female collegian to run sub-50 seconds in the 400 meters, in turn lowering her own collegiate record to 49.71. Her senior season also included an undefeated record against collegians and four NCAA titles (two individual, two relay). Texas won the 1988 and 2012 NCAA National Championships, with runner-up finishes in 1995, 2009, 2015, and 2016. They also won an AIAW national championship in 1981. The team is currently coached by Jerritt Elliott and plays home games in Gregory Gymnasium. Texas won the Big 12 Conference in 1997, 2007, 2008, 2009, 2011, 2012, 2013, 2014, 2015, and 2017. They finished 2nd in 1996, 1998, 2004, 2005, 2010, and 2016. They finished 3rd in 1999 and 2006. They have qualified for every NCAA tournament since 2004 and advanced to at least the Regional Finals since 2006. Texas volleyball has produced many All-Americans, and in 2007, they won the program's first Big 12 title since 1997, sharing the title with Nebraska. Texas broke Nebraska's three-year streak of winning the title outright. They also earned the programs first AVCA National Freshman of the Year since 1995 in 2007, for Big 12 Freshman of the Year Juliann Faucette. Texas has won fourteen national titles in men's swimming and diving (1981, 1988–1991, 1996, 2000–2002, 2010, 2015–18) and nine in women's swimming and diving (1981–82, 1984–88, 1990–91), making swimming and diving the most successful Texas athletics program by far, based on number of national titles. The men's swimming team is currently coached by Eddie Reese, the women's swimming team by Carol Capitani, and the diving teams by Matt Scoggin. Reese has coached numerous former and current world record holders while at Texas, including many competing in the Summer Olympic Games for the United States and other home nations. The swim team was first developed under Coach Tex Robertson. The women's rowing team was established in the fall of 1998. At the team's first appearance at the NCAA championships in 2003, its varsity 8 placed 12th nationally. The team won the inaugural Big 12 Championship in 2009 and kept the championship title for the following three years. Additionally, the Texas women's rowing team won the 2011 Conference USA Championship. In June 2014, Dave O'Neill was appointed head coach of the program. The women's rowing team placed 4th in the 2017 NCAA Championship and 3rd in 2018, marking the program's best two finishes. Founded in 1985, the Texas Longhorns rugby team plays in the Allied Rugby Conference, and plays its postseason in the Varsity Cup Championship. The Longhorns rugby program has been improving in recent years. Texas rugby has instituted a combine to identify the most elite athletes on campus with an eye towards recruiting them to play rugby. The increasing popularity of rugby in the United States and the announcement that rugby would return to the Summer Olympics led Texas to upgrade the designation of its rugby program from club to Olympic. The Texas Rugby Alumni association and the Texas Exes have begun an endowment to award scholarships to Texas rugby players, which is viewed as a vital recruitment tool. The Longhorns' improvement led to Texas winning the Southwest Conference in the 2011–12 season to qualify for the sweet sixteen of the 2012 national championship playoffs. Texas won the 2012 Southwest 7s tournament to qualify for the 2012 USA Rugby Sevens Collegiate National Championships. The Longhorns rugby program has been boosted by its participation in the Collegiate Rugby Championship, the highest profile college rugby competition in the US, which is broadcast live on NBC. In the 2011 CRC, Texas defeated Big 12 rival Oklahoma to reach the quarterfinals. Following Texas' participation in the 2011 CRC, Texas "raised an additional $10,000 from alumni, landed a new apparel sponsor, and have been contacted by 90 students (including two DBs from the football team) who want to play rugby." In the 2012 CRC, Texas defeated its rival Oklahoma to again reach the quarterfinals of the tournament. The Longhorns rugby program reached a new all-time high during the 2013–2014 season. Texas won the 2013 Southwest Conference 7s Championship advancing them to the 2013 USA Rugby Sevens Collegiate National Championships, where they finished ranked #12 in the nation. Months later Texas won the 2014 Southwest Conference 15s Championship, making them the first team in the conference to win both the 7s and 15s championships in the same season. The Longhorns finished the season with their first participation in The Varsity Cup Championship, where they finished in the top 8. Texas has won 46 NCAA team national championships. † Denotes an AIAW Championship. The University of Texas began NCAA and Southwest Conference competition in women's sports for the 1982–83 season. The university's biggest rival is Texas A&M University. However, in football, Texas considers the Oklahoma Sooners to be a more significant rival. According to Bill Little, the Longhorns' assistant athletic director, the rivalry against A&M is "based on respect", while the rivalry against Oklahoma is "based on anger". Other teams have also been considered to be rivals of the Longhorns in various sports. This list includes several other colleges in Texas, such as Texas Christian, Baylor, Rice, Texas Tech, and Houston. Texas is also one of the biggest rivals of the University of Arkansas, which may be attributed to their long tenure as the two eponymous state schools of the former Southwest Conference, or to the 1969 game between the two, which decided the national championship in favor of the Longhorns. Texas has a long-standing, bitter rivalry with the University of Oklahoma. The football game between the University of Texas and Oklahoma is commonly known as the "Red River Shootout" and is held annually in Dallas, Texas, at the Cotton Bowl. This name has come to refer to the two schools' contests in other major team sports as well. Since 2005, the football game has received sponsorship dollars in return for being referred to as the "SBC Red River Rivalry" (changed to AT&T Red River Rivalry in 2006 when SBC changed its corporate name to AT&T), a move which has been criticized both for its commercialism and its political correctness. In recent years,[when?] this rivalry has taken on added significance, since both football programs have been highly ranked and compete in the same division of the Big 12 conference. In 2005, The Dallas Morning News did an opinion poll of the 119 Division 1A football coaches as to the nations top rivalry game in college football. The Texas–Oklahoma game was ranked third. The annual football game with Texas A&M usually took place on the weekend of Thanksgiving each year, though it was moved to the first weekend in December in 1994 due to A&M's TV restriction during probation. In either case, the Texas-Texas A&M game was the last regular-season contest for each team. The Longhorns lead the series, 76–37–5. In an attempt to generate more attention for the rivalry in sports other than football, in 2004 the two schools started the Lone Star Showdown, which began as a two-year trial program and has continued ever since. Essentially, each time the two schools meet in a sport, the winner of the matchup gets a point. In sports wherein the teams meet twice one half point is awarded for a victory. If more contests than two occur, such as in baseball, the series winner gets one point. At the end of the year, the school with the most points wins the series and receives a trophy. In the event of a tie the current holder retains the trophy as did A&M after the '08–'09 season. Texas leads the series 6–2. The football series between the two universities is the third longest running rivalry in all of college football. From 1900 – 2011, the last regular season football game was usually reserved for their matchup. Texas has a unique lighting scheme for the Tower after wins over Texas A&M. In the past, mischief has preceded the annual game, such as "kidnapping" each other's mascots. With Texas A&M's move to the Southeastern Conference, the Lone Star Showdown's final game was played on November 24, 2011, at Kyle Field. The Longhorns won, 27–25, on a last-second field goal. Another game between Texas and Texas A&M will not happen until at least 2018, according to Texas athletic director DeLoss Dodds. The 2011 game marked the end of the 118-year Thanksgiving Day tradition. The Longhorns and Red Raiders football teams compete annually for a traveling trophy called the Chancellor's Spurs. The exchange began in 1996, and the Longhorns lead the football series, 48–15. A long-standing more historic rivalry with the Rice Owls that has been largely dominated by Texas since their days in the Southwest Conference is still played almost annually, with Texas winning the latest matchup (2015 contest) 42–28. The Rice Owls last victory in the rivalry came in 1994 when they beat Texas, 19–17, at Rice Stadium on ESPN and the Owls went on to win the Southwest Conference that year. In addition, the University of Texas has numerous practice, training, and intramural facilities. Kennedy's moon speech – Why does Rice play Texas? Wikimedia Commons has media related to University of Texas at Austin. Bevo – the school mascot, a live Texas longhorn steer present for football games and other special events. It is a common misconception that the mascot's name came from Texas students altering a 13–0 branding a group of Aggies gave the steer. Bevo was received his name several months before the Aggies could vandalize the steer in a Texas alumni magazine. His name came from the slang term for a steer that is destined to become food, beeve, and in a common practice for the 00's and 10's, an "O" was added at the end, similar to Groucho or Harpo Marx. Big Bertha – Claimed by the university to be the world's largest drum, however Purdue University makes a similar claim about their drum. "The Eyes of Texas" – the school song, traditionally led by the Orange Jackets on the football field, sung to the tune of "I've Been Working on the Railroad"
Hook 'em Horns – the school hand signal, was introduced at a pep rally in 1955. Sports Illustrated featured the Hook 'em Horns symbol in front of a Texas pennant on the cover of their September 10, 1973 issue (pictured). The World's Largest Texas Flag is run on the field prior to home football games, bowl games, and other sporting events. It is also dropped from the President's Balcony during pep rallies. It is owned by the UT Alpha Rho chapter of Alpha Phi Omega. Lighting the Tower (also known as the Main Building) in orange for various types of sporting victories. After national championship victories, windows are lighted in the main building to display a large number "1". Read the rest – Students from primarily Texas A&M University usually taunt Texas students by threatening to "saw off" the horns of Bevo, citing the Bible verse Psalms 75:10: "I shall cut off the horns of the wicked." As it turns out, that's not the entire verse, and as a response, Texas students tell Aggies to "read the rest". The rest of the verse is "but the horns of the righteous shall be lifted up." This appears on shirts, usually with "Hook 'Em" written underneath. Their other primary rivals, the Oklahoma Sooners, generally prefer to show their disdain by inverting the "Hook 'Em" hand sign or Longhorn logo. This gesture has become more common among fans of other teams as well, especially in the Big 12, when they play against Texas. For nine straight years (2005–2013), Texas was listed as the number one Collegiate Licensing Company client in regards to the amount of annual trademark royalties received from the sales of its fan merchandise. Schools that are not members of Collegiate Licensing Company however are not ranked in the listing. Money from merchandising sales goes to the university, as opposed to being earmarked specifically for athletics programs. On January 20, 2011, the UT athletic department announced plans to launch a 24-hour channel devoted entirely to UT sports and academic activities at the University of Texas. This channel, a joint venture with ESPN, takes advantage of a clause in new Big 12 Conference television contracts allowing Texas a bigger share of revenues than the conference's other members; in turn, it was part of the agreement to keep the conference together amidst a full-scale plan by the Pac-10 Conference to raid Big 12 members. (The Pac-10 only gained one Big 12 school, Colorado). Both sides hoped to launch the channel for the 2011–2012 academic year, but needed carriage commitments first. Banners with the name "ESPN Texas" were visible during segments of SportsCenter and other programs originating from Sundance Square in Fort Worth, Texas in the week prior to Super Bowl XLV. The channel was launched in August 2011 as the Longhorn Network. Before its launch, the network had controversial plans to air high school football games, an institution throughout the state of Texas. Currently, the state's governing body for public high school sports, the University Interscholastic League, prohibits live game telecasts on Friday nights. It had also been speculated that any telecast on the new channel, regardless of when it aired, could violate NCAA rules against unfair recruiting inducements. This was especially an issue for Texas A&M; in fact, the plans for the network to air high school games directly led to A&M's decision in July, 2011, to leave the Big 12 for the SEC. The Big 12 then approved a temporary rule in August 2011 banning the planned high school telecasts, and within two weeks, the NCAA ruled that no school or conference network could broadcast high school games, ending that particular controversy. B. M. "Mack" Rankin Jr.
^ "Colors | Brand | The University of Texas". Retrieved August 11, 2016. ^ "Texas State Symbols". Texas State Library and Archives Commission. Retrieved August 12, 2016. ^ Barry Popik's archives Longhorn (University of Texas nickname) Accessed September 9, 2006. ^ a b c "CLC Names Top Selling Universities And Manufacturers for 2013–14". Archived from the original on October 30, 2014. Retrieved October 21, 2014. ^ "Arkansas to merge men's, women's athletic programs". ESPN. Associated Press. November 15, 2007. Retrieved December 31, 2008. ^ Low, Chris (June 9, 2011). "Joan Cronan named Vols' interim AD". ESPN. Retrieved June 10, 2011. ^ Board of Regents Meeting Minutes, p.43-44 – July 31, 1970 Archived March 4, 2006, at the Wayback Machine The University of Texas System. Accessed February 27, 2006. ^ The University of Texas Style Guidelines – signed by Texas president Larry Faulkner. Accessed February 27, 2006. ^ Berry, Margaret C. The University of Texas at Austin from the Handbook of Texas Online. Accessed December 1, 2005. ^ "TexasSports.com". TexasSports.com. June 12, 2012. Retrieved June 24, 2012. ^ "College Football Hall of Fame". Collegefootball.org. Archived from the original on December 21, 2003. Retrieved June 24, 2012. ^ Division I-A All-Time Wins Archived January 22, 2009, at the Wayback Machine. College Football Database. ^ "Darrell K Royal–Texas Memorial Stadium". Mack Brown Texas Football. Archived from the original on September 5, 2006. Retrieved September 22, 2006. ^ Young, Meghan. Regents approve stadium upgrades November 10, 2005 The Daily Texan. ^ "Longhorns choose Daktronics for HD video display". Mackbrown-texasfootball.com. Archived from the original on June 12, 2008. Retrieved June 24, 2012. ^ "Official website of University of Texas Athletics – Texas Longhorns – Facilities". TexasSports.com. Retrieved June 24, 2012. ^ "Official website of the Texas Longhorns – Texas Football". Mack Brown Texas Football. Archived from the original on November 1, 2010. Retrieved June 24, 2012. ^ "September's intriguing matchups". ESPN. July 26, 2006. Retrieved August 3, 2006. ^ Johnston, Joey (September 7, 2006). "Home field will lift Texas over Ohio St. Buckeyes vs. Longhorns on Saturday very well could be Game of the Year". MSNBC. Retrieved September 7, 2006. ^ "Texas now No. 2, preps for No. 1 Ohio St. – Saturday will be first 1–2 showdown in regular season since 1996". MSNBC. September 6, 2006. Retrieved September 8, 2006. ^ Schlabach, Mark (January 11, 2007). "Booty could return Trojans to No. 1 ranking". ESPN. Retrieved January 23, 2007. ^ McClellan, Mark (January 9, 2007). "Rivals.com 2007 Preseason Top 25". ESPN. Archived from the original on January 16, 2007. Retrieved January 18, 2007. ^ "CFN 2007 Pre-Preseason Rankings – Top 25". Scout.com. College Football News. January 14, 2007. Archived from the original on January 27, 2007. Retrieved January 23, 2007. ^ "2007 Preseason Rankings, National Title Contenders – No. 1 to No. 25". Scout.com. College Football News. Archived from the original on January 27, 2007. Retrieved January 16, 2007. ^ "Longhorns ranked fourth in coaches poll". Austin American-Statesman. August 3, 2007. Archived from the original on September 29, 2007. Retrieved August 3, 2007. ^ Russo, Ralph (August 19, 2007). "USC Is No. 1 in AP Top 25 College Poll". Associated Press. Archived from the original on August 22, 2007. Retrieved August 19, 2007. ^ "NCAA College Football Polls, College Football Rankings, NCAA Football Poll". ESPN. August 24, 2008. Retrieved December 4, 2008. ^ "2011 NCAA College Football Polls and Rankings for Week 1 – ESPN". ESPN. January 2, 2011. Retrieved June 24, 2012. ^ "Garrett Gilbert to transfer from Texas". ESPN. Retrieved January 21, 2017. ^ "Texas names Charlie Strong coach". ESPN. Retrieved June 29, 2018. ^ a b "Longhorns fire coach Charlie Strong after three seasons". ESPN. Retrieved June 29, 2018. ^ "Texas Football All-Americans". Mack Brown Texas Football. Retrieved March 3, 2007. ^ MacCambridge, Michael, ed. (2005). "The Annual Review". ESPN College Football Encyclopedia. ESPN Books. ^ "Slovick Trophy Winners". heisman.com. Archived from the original on April 11, 2007. Retrieved April 16, 2007. ^ "The Maxwell Award: Collegiate Player of the Year – Past Recipients". Maxwell Football Club. Archived from the original on February 14, 2009. Retrieved December 21, 2006. ^ "All-Time Outland Trophy Winners". Football Writers Association of America. Retrieved December 21, 2006. ^ Alder, James. "Walter Camp Award Winners". About.com. Retrieved December 21, 2006. ^ Alder, James. "Butkus Award Winners". About.com. Archived from the original on July 12, 2014. Retrieved December 21, 2006. ^ "The Davey O'Brien Awards". Davey O'Brien Foundation. Archived from the original on February 13, 2007. Retrieved April 16, 2007. ^ "Previous Davey O'Brien National Quarterback Award Winners". Davey O'Brien Foundation. Archived from the original on December 7, 2006. Retrieved December 21, 2006. ^ "Awards". Touchdown Club of Columbus. Archived from the original on October 16, 2007. Retrieved January 13, 2009. ^ Alder, James. "Lombardi Award". About.com. Retrieved December 21, 2006. ^ "Past Winners of the Bronko Nagurski Trophy". The Bronko Nagurski Charlotte Touchdown Club. Archived from the original on September 28, 2007. Retrieved April 16, 2007. ^ "The Jim Thorpe Award – Past Winners". The Jim Thorpe Association. Archived from the original on October 6, 2007. Retrieved December 21, 2006. ^ "The William V. Campbell Trophy (formerly Draddy Trophy)". National Football Foundation. Retrieved January 2, 2008. ^ Brown, Chip (December 5, 2007). "Texas Longhorns' football player wins Draddy Trophy". Dallas Morning News. Retrieved January 2, 2008. ^ "Ted Hendricks Award Recipients". Ted Hendricks Foundation. Retrieved December 20, 2008. ^ "Timeline: A history of Texas basketball". Austin American-Statesman. November 15, 2005. Archived from the original on January 1, 2007. Retrieved April 18, 2007. ^ a b "NCAA 2018–19 Men's Basketball Record Book" (PDF). NCAASports.com. p. 71. Retrieved November 10, 2018. ^ a b "NCAA 2015 Men's Final Four Record Book" (PDF). NCAASports.com. pp. 41–55. Archived (PDF) from the original on May 18, 2015. Retrieved April 25, 2015. ^ "2014–2015 Men's Basketball Cumulative Statistics". texassports.com. Archived from the original on April 13, 2015. Retrieved April 25, 2015. ^ "2014–15 Texas Basketball Fact Book" (PDF). texassports.com. p. 6. Archived (PDF) from the original on January 8, 2015. Retrieved April 25, 2015. ^ "2015 NCAA Division I Men's Basketball Tournament Bracket". ncaa.com. Archived from the original on April 19, 2015. Retrieved April 30, 2015. ^ "Harris Vault". Harris Interactive. Retrieved June 24, 2012. ^ ESPN, ed. (2009). ESPN College Basketball Encyclopedia: The Complete History of the Men's Game. New York: ESPN Books. p. 542. ISBN 978-0-345-51392-2. ^ "Garrido accepts position as Special Assistant to Athletics Director, relinquishes duties as Baseball coach". TexasSports.com. Retrieved January 21, 2017. ^ "Texas Longhorns Men's Golf – 2012–13 roster". Retrieved June 11, 2013. ^ "Courtney Okolo Wins The Bowerman ::: The Bowerman: The Nation's Top Award for Collegiate Track & Field Athletes". U.S. Track & Field and Cross Country Coaches Association. Retrieved December 31, 2018. ^ "Biography – Tex Robertson". Archived from the original on November 29, 2010. Retrieved May 24, 2010. ^ "UT Rowing coach announces retirement". May 22, 2014. Archived from the original on February 4, 2015. Retrieved February 4, 2015. ^ "Texas rowing hires Cal's O'Neill". June 26, 2014. Retrieved February 4, 2015. ^ "2016 Texas Soccer Factbook" (PDF). Retrieved March 10, 2019. ^ "About Us". UT Rugby. Retrieved June 24, 2012. ^ "The Daily Texan, Club rugby prepares for championships". The Daily Texan. January 27, 2012. Archived from the original on July 30, 2012. Retrieved June 24, 2012. ^ "The Alcalde, Texas Rugby Eyes Championship, Starts Scholarship". Texas Exes. January 9, 2012. Retrieved June 24, 2012. ^ "Rugby in Texas, UT Wins SWC Crown, Tech Takes D-II". Rugbyintexas.com. March 26, 2012. Retrieved June 24, 2012. ^ "Rugby Mag, 15 Teams Invited to 2012 CRC". Rugbymag.com. November 3, 2011. Retrieved June 24, 2012. ^ Oxford, Justin. "Texas Rugby Finishes #12 in the Nation in 7s!!". UT Rugby. Retrieved April 29, 2014. ^ Oxford, Justin. "Disciplined Navy Sails Past Rattled Texas". UT Rugby. Retrieved April 29, 2014. ^ Men's Athletics Hall of Honor Archived September 20, 2011, at the Wayback Machine. University of Texas Athletics official website. Retrieved 2011-09-10. "Founded in 1957, the Longhorn Hall of Honor is one of the most cherished athletics traditions at The University of Texas." ^ Women's Athletics Hall of Honor Archived September 20, 2011, at the Wayback Machine. University of Texas Athletics official website. Retrieved 2011-09-10. "The UT Women's Athletics Hall of Honor was created in 2000 ...."
^ Texas Longhorns Championships History: Conference Championships Archived September 14, 2009, at the Wayback Machine. TexasSports.com. ^ "Conference Championships". texassports.com. Retrieved May 5, 2018. ^ "What is Texas' biggest sports rivalry?". Sports Illustrated. Retrieved July 11, 2006. ^ "A Red River rivalry – UT's attention has shifted from Texas A&M to Oklahoma". The Daily Texan. October 4, 2004. ^ "Longhorns bounce back against rival, Sam Houston". ESPN. Retrieved July 11, 2006. ^ "Texas calls on Omaha architectural firm to build stadium worthy of program". TexasSports.com. June 18, 2006. Archived from the original on November 28, 2006. Retrieved July 11, 2006. ^ Brown, Jacob (March 9, 2005). "Texas, Rice, ensue rivalry at the Dish". The Daily Texan. Archived from the original on September 30, 2007. Retrieved July 11, 2006. ^ "'No Place Else But Texas'". ESPN. December 26, 2001. Retrieved March 10, 2009. ^ Clark, Kyle (March 25, 2003). "Women's tennis finds positives in loss to rival Longhorns". The Daily Toreador. Archived from the original on March 19, 2008. Retrieved July 11, 2006. ^ "The Cougars and the Longhorns : History and Hatred". Mindspring. Archived from the original on May 17, 2006. Retrieved July 11, 2006. ^ Clint, Hale (September 3, 2003). "Offense using bye week to prepare for Arkansas". The Daily Texan. Archived from the original on September 30, 2007. Retrieved July 11, 2006. ^ "Texas 1969 Champions a Left a Lasting Legacy". CollegeSportsTV.com. Associated Press. Retrieved July 11, 2006. ^ Frei, Terry (2002). Horns, Hogs, and Nixon Coming: Texas vs. Arkansas in Dixie's Last Stand. USA: Simon & Schuster. ISBN 0-7432-2447-7. ^ "SBC Companies Extend Sponsorship with Universities of Oklahoma and Texas for the SBC Red River Rivalry". ATT.com. Retrieved July 11, 2006. ^ "From the Daily:Adhering to tradition – SBC Sponsor Threatened Game's Integrity". The Michigan Daily. July 10, 2006. Archived from the original on September 30, 2007. Retrieved July 11, 2006. ^ "Defense's goal is 13 points or less". Houston Chronicle. August 11, 2005. Retrieved July 11, 2006. ^ Davis, Brian (October 7, 2005). "UT-OU : Best Rivalry?". The Dallas Morning News. Retrieved July 11, 2006. ^ "Lone Star Showdown". Retrieved July 11, 2006. ^ "History of School and Fight Songs". The University of Texas Longhorn Band website. Archived from the original on June 15, 2006. Retrieved July 11, 2006. ^ "The Aggie War Hymn". Official Website of Texas A&M Athletics. Archived from the original on May 22, 2006. Retrieved July 11, 2006. ^ Wieberg, Steve (November 24, 2005). "Texas following usual rivalry game routine". USA Today. Retrieved July 11, 2006. ^ "All Time Results". MackBrownTexasFootball.com. Retrieved July 11, 2006. ^ "The Bonfire Burns". StudentBonfire.com. Retrieved July 11, 2006. ^ "Hex Rally". MackBrownTexasFootball.com. Retrieved July 11, 2006. ^ University approves new policy for lighting UT Tower Archived October 12, 2007, at the Wayback Machine On Campus. Accessed December 1, 2005. ^ Nikar, Jim. "Bevo". MackBrownTexasFootball.com. Retrieved July 11, 2006. ^ "Retired Mascot Reveille VI Euthanized Oct 18". Official website of Texas A&M University. Archived from the original on March 17, 2005. Retrieved July 11, 2006. ^ "Official website of the Texas Longhorns – Texas Football". MackBrown-TexasFootball.com. February 12, 1917. Archived from the original on July 1, 2012. Retrieved June 24, 2012. ^ Proud Traditions: Hook 'em Horns Archived June 26, 2006, at the Wayback Machine Mack Brown Texas Football. ^ "No. 1 – Hook 'em Horns! Sports Illustrated". Sports Illustrated. September 10, 1973. 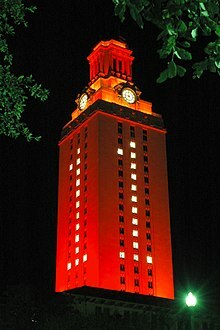 ^ "University Approves new policy for lighting UT tower". "Office of Public Affairs, University of Texas at Austin". January 29, 2002. Archived from the original on October 12, 2007. Retrieved September 26, 2008. ^ "The Collegiate Licensing Company Rankings". Archived from the original on August 19, 2007. Retrieved August 17, 2007. ^ "UT To Unveil 20-Year, $300M Deal With ESPN". Retrieved February 25, 2011. ^ "Bevo TV's Dirty Little Secret: All About Recruiting". Archived from the original on March 3, 2011. Retrieved February 25, 2011. ^ Staples, Andy (July 5, 2012). "TCU finally in Big 12". Inside College Football. Sports Illustrated. p. 2. Retrieved November 7, 2012 – via CNN. ^ Finger, Mike (August 11, 2011). "Longhorn Network's high school plans permanently shot down". San Antonio Express. Retrieved September 3, 2011. ^ Karp, Hannah (December 17, 2009). "Boosters". The Wall Street Journal. Retrieved December 2, 2010.